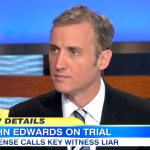 Dan Abrams appeared on Good Morning America Wednesday to discuss a key witness in the case against John Edwards, who Bob Woodruff is now calling one of the most unpopular men in America. Andrew Young’s testimony against his former boss began Wednesday and could even continue into next week. He faced a “very aggressive cross examination” according to Dan, who believes that Young is a “mixed witness” in that he helps the prosecution on one of two key issues. The first, “Did John Edwards know about [what was going on]”? and the second “what was the money used for.” Young has “been very powerful with ‘did Edwards know. '” As to what the contributions were used for? This is tougher for Young, a former employee of Edwards’ whose basic position is that Edwards is a liar, challenging the very foundation of the prosecution’s case – Edwards’ credibility. Not knowing whether the money was actually used for illegal purposes, to influence the campaign as opposed to a personal cover up. 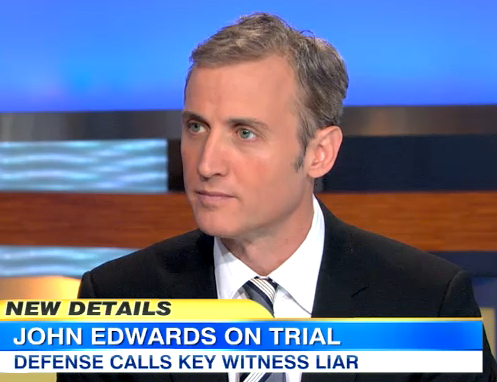 So it remains to be seen how much Young will be able to help the prosecution here – Dan doesn’t think Edwards will take the stand, “he doesn’t have too, it’s too risky – he’s facing far too many difficult questions.” Watch Dan Abrams and the full discussion here.